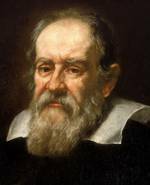 Galileo Galilei was born in Italy in 1564. Once, when 17 years old, he had his attention drawn to the chandelier of the local Cathedral, which was swinging in small arcs. Using his own pulse, Galileo concluded that the period of the swing or oscillation was independent of the amplitude of the chandelier’s movement. This inclination toward experimental investigations distinguished him from the men of his time. Galileo started to study Medicine in the University of Pisa, but after four years he abandoned it to dedicate himself to mathematics. At 24 he became Professor of Mathematics at Pisa but in 1592 Venice invited him to teach in the University of Padua. He had so many students there that he had to teach in the open. Perhaps the greatest contribution Galileo made to science was his development of a scientific method. His method consisted of three basic principles. Unprejudiced observation of natural phenomena as they happened, without reference to religious or philosophical views. Galileo made one of the first telescopes and was the first person to observe the mountains on the Moon. This led him to abandon Aristotle’s idea that all celestial bodies were perfect. Experimentation. Every scientific theory should be put to test in a practical experiment. Galileo is said to have climbed a tower in Pisa in order to drop two bodies of different masses to show that they fall with apparently equal velocities. Correct knowledge of nature should be expressed in mathematical terms. For example, declaring that the distance travelled by a falling body is proportional to the square of the time taken in falling. Galileo also found four moons orbiting around the planet Jupiter. This and other observations led him to believe the Copernican model of the solar system, which had all planets orbiting the Sun. Thus he came into conflict with the teaching of the Catholic Church, for whom the Earth was the centre of the Universe. In the year that Isaac Newton was born, 1642, Galileo died, blind and under house arrest for his scientific convictions. Discuss the importance of the scientific method with a classmate. Read more about how scientists' views influence their work in Social Influences and Experimenter Effect. Can a scientist really observe without prejudice?